A SUNNY Melbourne played host to the final round of the 2014 Heritage Touring Cars Championship over the November 8-9 weekend at Historic Sandown with a first-time HTC race winner headlining a big weekend of racing. Anthony Compton took his ex-Glenn Seton Peter Jackson Racing Sierra RS500 to his first race win in the category in the second of three races at Sandown. The turbocharged Ford – built to replace the car destroyed in a fiery multi-car accident at Lakeside in 1989 – finished second in Race 1 on Saturday to Terry Lawlor’s GIO Nissan GT-R before winning Race 2 on Sunday after Lawlor’s ‘Godzilla’ beast failed to start due to technical gremlins. Compton had a scare though in the last race on Sunday, forced to limp home to finish third in the 10-lap final due to being stuck in second gear after the gearstick snapped! Starting at the back of the grid for Race 3 didn’t slow down Lawlor, who blitzed through the pack to win the final race of the season for the Heritage Touring Cars class. Commodore driver Adrian Allisey turned in a brilliant weekend of racing in his Group A ‘Walkinshaw’ ex-Leeson/Willmington Holden to claim a third and two second places from the races. One of the most impressive drives of the weekend though came from Bryan Sala in Race 2 on Sunday. Misfire problems took his Sierra RS500 out of Race 1 on Saturday, forcing him to charge through from the back of the field and eventually finish third in Race 2 – impressive given it came in a five-lap race! Up and down the field there were a range of stories, interesting cars and all sorts of tales. BMW M3 pilots David Towe (ex JPS), Jervis Ward (Mobil #1 car) and Bill Cutler (ex-Schnitzer Bathurst 1987 car) flew the flag for fans of the Bavarian cars, while Tony Alford made his HTC debut in his Skyline GTS-R. The same car – later run by Alf and Tim Grant as a Sizzler privateer entry – was driven to third place at Bathurst in 1989 by Jim Richards and Mark Skaife and appeared in those well-known white, red and blue colours. Things were spirited too among the Group C cars at Sandown with Milton Seferis’ ex-Peter Janson Commodore VH claiming honours in Race 1 from Fraser Ross’ XD Falcon after a last-lap pass. Seferis again was the first Group C car home in Race 2 after Ross retired with damage before Seferis completed a clean sweep of the weekend in Race 3, leading home the ex-Murray Carter Falcon XE of Glenn Gerstel. Seferis’ Commodore made its racing debut at the 1984 Castrol 500 at Sandown, so it was perhaps appropriate the ex-Janson/Garry Rogers VH Holden was successful at the same track 30 years later! There were some casualties over the weekend – notably in the Nissan tent. The 1984 Bathurst pole-sitting Bluebird of Brian Henderson ran on Friday but ignition problems sidelined it from Race 1 on Saturday and it did not take to the track on Sunday. The sister car owned and driven by Adam Workman was a solid runner on Saturday and then again in Race 2 on Sunday before being sidelined with wheel bearing dramas ahead of Race 3. Mike Roddy returned to HTC racing with his glorious V12-powered ex-John Goss, 1985 Bathurst-winning Jaguar XJ-S but found himself excluded from Race 2. After spinning on the warm up lap, the ‘big cat’ passed cars to re-claim its grid position prior to the field reaching the green flag, which was deemed unsatisfactory by Race Control. Gary Rowe made his first appearance too in his recently acquired BF Goodrich Mazda RX-7 Group C car to provide some competition for John Douglas’ Berklee Exhausts car. All in all it was a great way to finish the 2014 season for the highly-popular Historic category which celebrates the ‘Legends of Bathurst’. The Heritage Touring Cars category will return in 2015 for a six-round series with an additional non-points scoring event at the Bathurst Motor Festival at Easter. 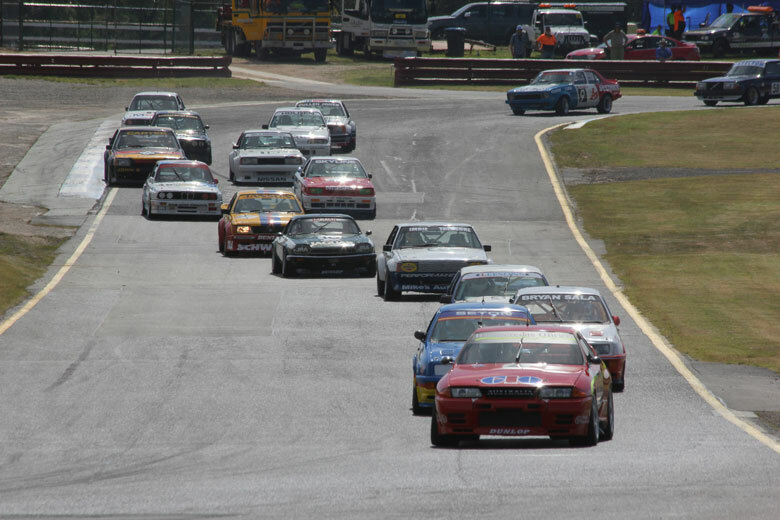 The new season and HTC title chase will begin at Wakefield Park near Goulburn on February 21-22, 2015.